People are not happy with Allison Williams MTV Movie Awards jokes. Allison William's MTV Movie and TV Awards skit has been labelled "racist" and "inappropriate" by fans. She was nominated for Best Villain for her role as Rose Armitage in Get Out, but now it’s Allison Williams herself who has found herself under fire. The actress, who stars in the horror film that tackles issues of racism, was presenting the award for Best Kiss to Moonlight at the MTV TV and Movie Awards with her co-star Lil Rel Howery. As is customary before announcing the winner, the pair were engaging in some supposedly entertaining banter inspired by her character. Howery pretended to be frightened of her in reference to her very scary, very racist character Rose. Joking that she wasn’t Rose and wanting to win back the trust of Howery – and the larger black community – and prove she’s on their side, Williams pretended to come up with some ideas she think could work. The problem? They play up to the very racial stereotypes Get Out aimed to breakdown. She suggests making it illegal for someone to ask a black person if they can touch their hair and switching out George Washington&apos;s face on Mount Rushmore for Denzel Washington&apos;s before getting Howery finally on side by saying she&apos;ll get Beyonce to put her Lemonade album on Spotify. While it&apos;s worth keeping in mind that these presenting skits are often scripted and not necessarily the work of the presenter or even just one person, many viewers found the scene to be tasteless and not funny. "I just caught Best Kiss congrats to Ash Sanders for his win! But Allison Williams was not funny. 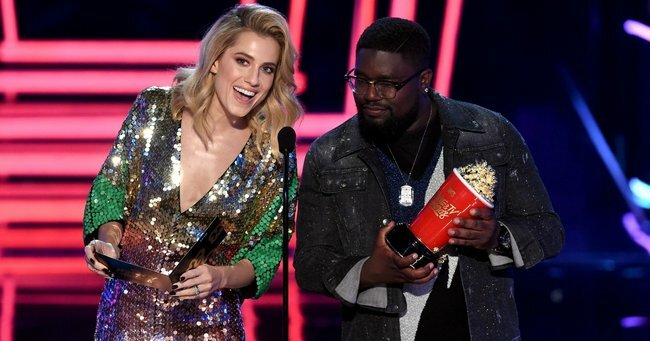 White privilege at its finest," tweeted one viewer while another added "Allison Williams saying yes to the &apos;let&apos;s make playful racist jokes&apos; bit for the MTV Awards BLOWS ME AWAY." Williams is yet to acknowledge or comment on the criticism.